Love the autumn colours and if you have some young ones, Halloween with the costumes, the decorating, the visits to the Pumpkin Patch, the anticipation of Trick and Treating all mix well together during October. In Canada we get to add in Thanksgiving Day on the 2nd Sunday of the month. This year it falls on October 13th. This year a few more vignettes were added around the house. To the entry the little shelf got a few pumpkins, crows and a big spider web. 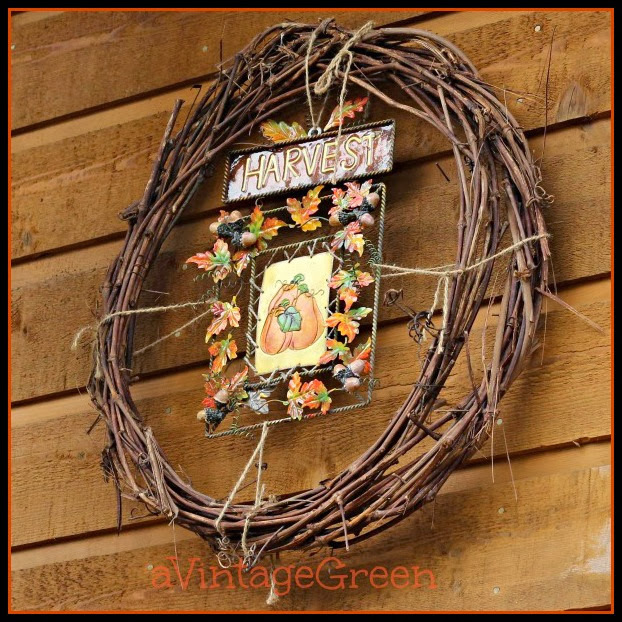 The wreath outside the front door became a Harvest Wreath (no work involved, just tied the thrifted sign on to a big grape vine wreath). The kitchen hutch got a few changes from summer to autumn. The fun was in making a new chalkboard (thrifted frame). The frame came with a wooden backing and was just right for a chalkboard. Always fun to change things up, pleases me as well as DGS. 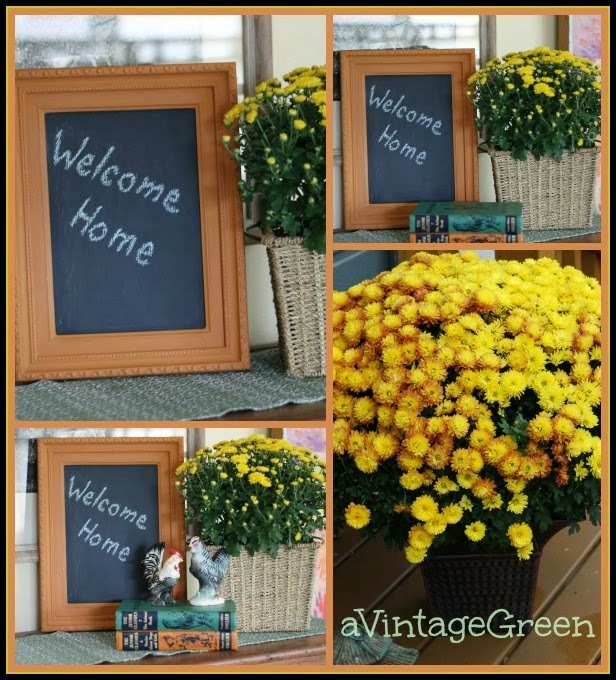 Large http://www.findingsilverpennies.com/2013/10/silver-pennies-sundays-link-party.htmlorange/yellow mums are on the front porch. I am always so impressed with the thrifty finds of bloggers and the great things they create. Your chalkboard is wonderful. I enjoyed all of your fall vignettes! Looks like you are ready for Thanksgiving! Love all your pretty colors! I love chalkboards, and am always coming up with new ways to turn something into one. Yours is very cute. They're all great ideas - so simple....but you have to have the idea, which is always my problem! Thanks for sharing. Thank you for visiting my blog and for your nice comment. I have not been seeing my dashboard lately and have been missing several blogs. Seems like I am living in slow motion and not getting near all the things I would like to do accomplished. You are good at arranging vinettes. Enjoyed seeing your fall ones here. Also one of my favorite things to do. Love love love the color of that chalkboard. Did I mention that I love it? 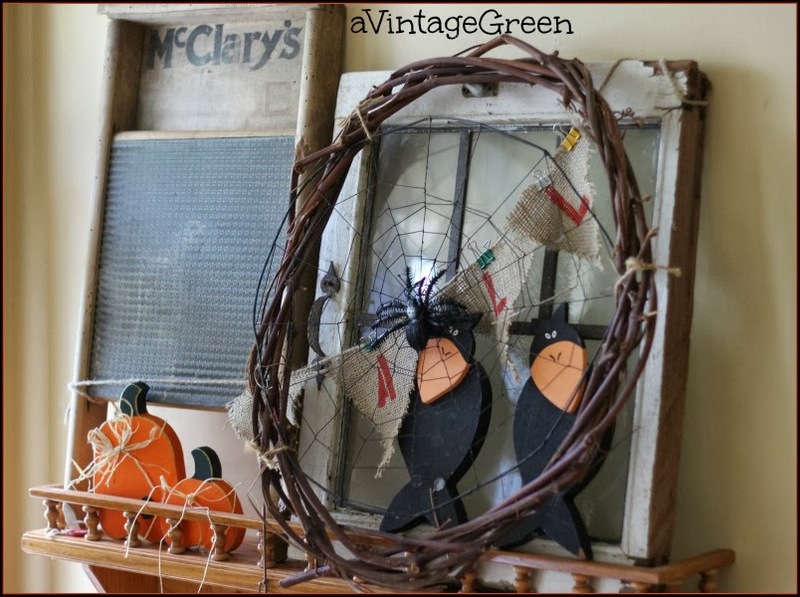 I love your touches of fall Joy and the pumpkin color on the frame is so perfect. I had a sample paint that color, but it was all dried up this year. Need more. Wonderful creations! I love the chalkboard and the pretty wreath! Enjoy your week ahead! You have created some nice autumnal accents. Creative! I love the colors. Just a few subtle decor changes make a nice difference for the seasons. I like how you;ve featured autumn in your mosaic. I *love* the crows on your kitchen hutch! The chalkboard is great; I love the orange frame. Thank you for sharing, Joy. 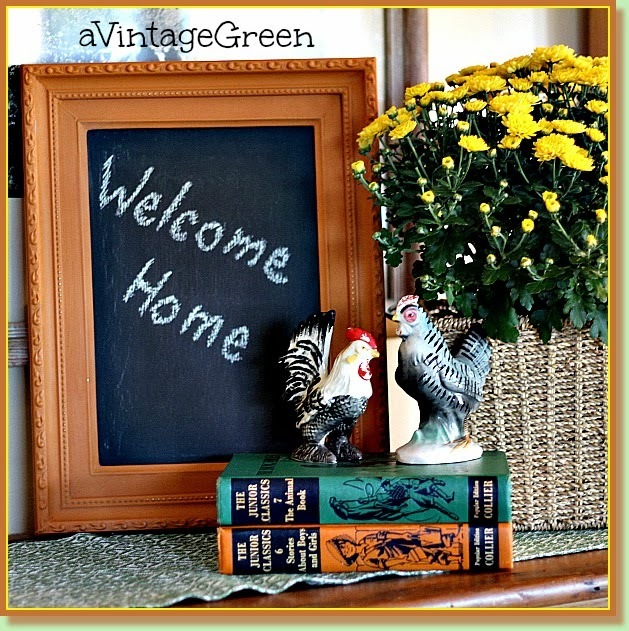 Your home wears Autumn well, and "Welcome Home" is just how it makes you feel. Love your chalkboard. I have a love for chalkboards, too. What a cute project for the fall holidays. Love the orange chalkboard. I actually didn't know you were Canadian, too. I'm excited to celebrate this year, we finally have a table, I've got a table cloth & all that stuff. Digging the chalkboard, great colour! I love the vignette with the window frame. It looks so fall. I have an old window that I am going to be using today for my mantle. I just need some old fence sections to go with it. (don't ask why), I did find some last year but they are being stored in a friends garage. And she's not home at the moment, and I want to get this done today. Patience is not my name! Hi what a cute and creative idea! I love what you made for fall! I saw it on i gotta create. 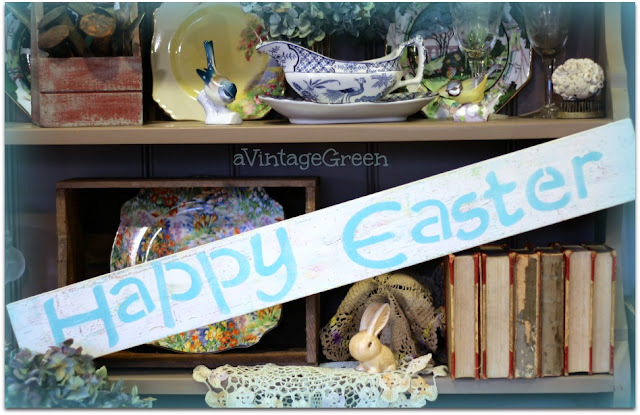 I love how you tied that thrifted sign on the wreath, looks great. I wonder if you've tried the chalkboard spray paint, too? That's what I've used, and haven't used the brush-on kind. The spray kind goes on ok, but it's hard to erase the chalk well, even after sanding a bit. Just wondered if you had experience with both and could compare? 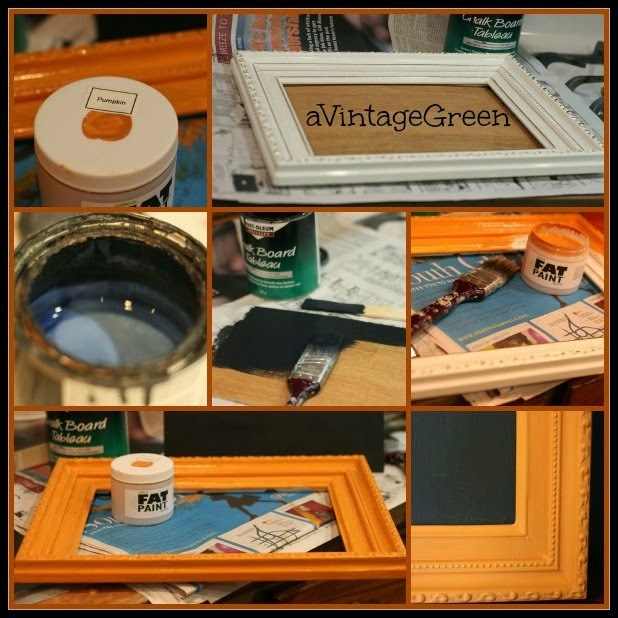 Really like the chalkboard frame - I've never worked with blackboard paint before - may need to give it a try. I'm a new follower from Lovely Ladies Linky Party. Sweet idea and I do love your crows! Thanks so much for sharing at AMAZE ME MONDAY! Gorgeous Autumn colours Joy- and I love your little chalkboard! Thanks so much for sharing it at the Get Your DIY On Chalkboard Challenge!! Hope you are able to make it back with a thrifty Halloween project (if you haven't already!!). Happy Thanksgiving from a fellow Canuck! Beautiful Fall welcome Joy! Hope you had a wonderful Thanksgiving! Thanks for sharing with SYC.